Palani Mohan / Getty Images. The Teej festival is an important festival for married women, and much anticipated monsoon festival. It's dedicated to celebrating the holy union of Lord Shiva and Goddess Parvati. According to Hindu texts, Parvati is an incarnation of Lord Shiva's first wife, Sati. Lord Shiva became grief-stricken and withdrawn after she immolated herself in protest of her father's disapproval of him. It took her 108 subsequent births to bring Shiva out of his meditative state and get him to accept her as his wife again. Her 108th birth was as Goddess Parvati. The invocation of Parvati's blessing during the festival is believed to bring about continued marital bliss. "Teej" refers to the third day after the new moon, and third day after the full moon, every month. During the monsoon season, these festivals are celebrated on the third day of the bright half of the Hindu month of Shravan, and on the third day of the waning and waxing moons in the Hindu month of Bhadrapad. This means that there are actually three Teej festivals -- known as Haryali (Green) Teej, Kajari/Kajli Teej and Hartalika Teej. In 2018, these festivals will take place on August 13-14, August 28-29, and September 12 respectively. The Teej festival is widely celebrated in northern and western India, particularly in the desert state of Rajasthan. From a tourist perspective, the best place to experience it is in Jaipur, where the festivities are the grandest and most renowned during Haryali Teej (August 13-14, 2018). For Kajari Teej celebrations (August 28-29, 2018), head to Bundi in Rajasthan. Teej festival fairs, featuring handicrafts and Rajasthani cultural performances, are also held at Dilli Haat, in Delhi. Women come together to fast and pray all night. In the morning, they bathe to purify themselves, and dress up in their finest red saris and jewelry to worship Goddess Parvati. They also get their hands decorated with henna, accompanied by the singing of special Teej festival songs. Swings are fixed to branches of large trees, and the women take turns to joyfully swing on them. The Teej festival is a very uplifting occasion. Girls engaged to be married receive a gift from their future in-laws on the day before the festival. The gift consists of henna, bangles, a special dress, and sweets. Married daughters are given gifts, clothes and sweets by their mother. After the worship has been completed, they're passed on to the mother-in-law. 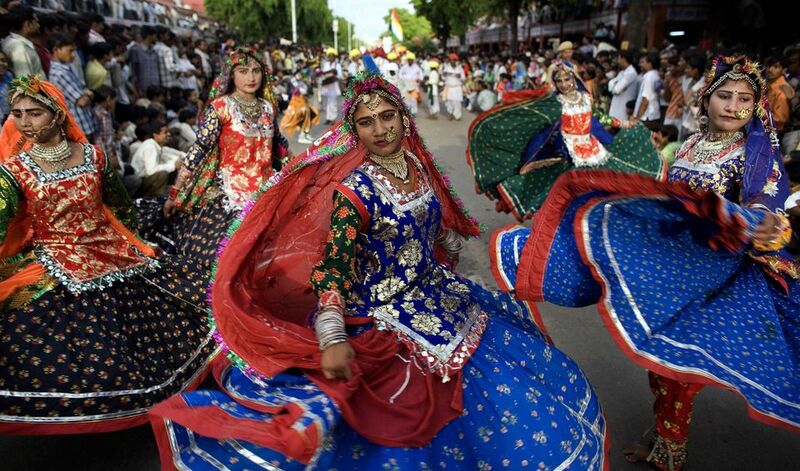 During both days of Haryali Teej in Jaipur, a spectacular royal procession featuring an idol of the Goddess Parvati (Teej Mata), winds its way through the lanes of the Old City. Known as Teej Sawari, it comprises antique palanquins, bullock carts pulling cannons, chariots, decorated elephants, horses, camels, brass bands, and dancers. A bit of everything really! The procession starts out from Tripolia Gate in the late afternoon and goes through Tripolia Bazaar and Chhoti Chaupar, Gangauri Bazaar, and ends at Chaugan Stadium. Tourists can watch and photograph it from the special seating area organized by Rajasthan Tourism on the terrace of the Hind Hotel, opposite Tripolia Gate. What's also noteworthy is that Teej Sawari is one of only two occasions when Tripola Gate opens each year. The other is the Gangaur festival procession. A rural fair is held during Kajari/Kajli Teej in Bundi and there's also a colorful street parade featuring a beautifully decorated idol of Goddess Parvati. Join Vedic Walks on their annual Teej Festival walking tour in Jaipur. You'll get to follow the procession, learn about the importance of the festival, taste specially made suites, explore local markets, and even meet the cousins of the erstwhile rulers of the city and see their beautiful mansion.